#ColumboTV: the world’s greatest social media experience? Every month, one of the most worthwhile social media experiences imaginable takes place. A group of Columbo superfans virtually gather to synchronously watch, discuss and debate a particular episode in what has become known as the #ColumboTV phenomenon. 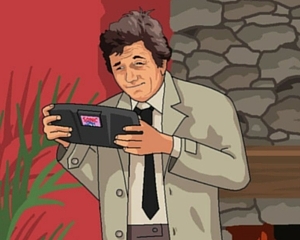 Taking place on Twitter, these Columbo ‘livetweets’ draw a motley assortment of fans from all over the word. We’ve had participants from the USA, Britain, Portugal, Kuwait, Australia, Canada, New Zealand, Scandinavia, France and beyond. It provides a Columbo viewing experience like no other. And we’d love you to become a part of it. #ColumboTV – how does it work? Each monthly gathering is hosted by a Columbo fan, who nominates an episode of their choosing, or puts a selection forward for a public vote. Then, at a pre-arranged and well-publicised date and time (usually a Saturday afternoon/evening), dozens of fellow fans join the host from the comfort of their own homes to watch and tweet along together. Using the hashtag has other benefits, too. We’ve seen it trending, both globally and in different nations, helping to bring the initiative to the attentions of new faces, and helping to grow the online Columbo community. We’ve even had, wonder of wonders, actors from the show participate! Put simply, it makes the heart sing. Set yourself up on Twitter. It’s dead easy and will take you a few minutes. If you’re already on Twitter there’s no excuse for not joining us! You may want to download a program like TweetDeck that will allow you to follow the #ColumboTV hashtag more easily in real time from laptops. Check out the #ColumboTV schedule, which is regularly updated with the date and time of the next tweetalong; the episode being watched; and the Twitter handle of the host. Make sure you’re following the event host for updates. Make sure you’ve got the episode. We watch via our own DVDs (or previously Netflix before they cancelled the show), and hit ‘play’ on the order of the event host so we can all watch from as close to the same spot as possible. After viewing starts, tweet your comments on the show, using #ColumboTV in every tweet. Some first-time participants just like to sit back and view all the other comments to get to know their characters and personalities. There are some very funny folk involved, but it’s a very welcoming crowd, too, so don’t be afraid to get amongst it! Have fun as you’re doing it! Sometimes the host even provides a prize for the best tweet of the event, which is another lovely incentive to get involved. Quite what the Lieutenant would make of #ColumboTV remains a mystery. Polite bafflement…? From a personal point of view, I’ve been involved in #ColumboTV since the beginning and have hosted it twice. I recommend it highly. It’s brought me in contact with dozens of great people, many of whom I adore even though I’ve never met them in real life. Social media can bring out the worst in people. There’s a lot of trolling, and bullies hiding behind a digital ID. Not so with #ColumboTV. Here we revel in each other’s virtual company and have that rare opportunity to celebrate the greatest show ever made, and pay homage to the wonder of Peter Falk. If you’re active on Twitter, please look me up! My Twitter handle is @columbophile and I’d be delighted to make your acquaintance. 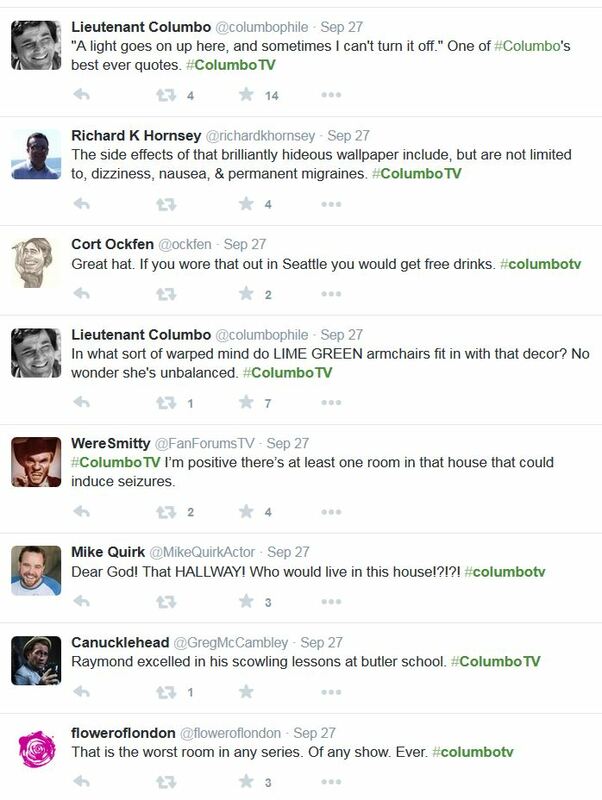 Tags: #ColumboTV, columbophile, Twitter. Bookmark the permalink. Previous post ← Who should have been a Columbo killer?